i tot the set come with Lumber already? hehe. unwanted, thanks for the detailed follow up on the posturefit kit. I'm considering taking up your suggestion of replacing the posturefit with the lumbar support. Will let you know shortly. hi i m interested in the aeron C. what color, specific model is it? can you sms the price of the 2 options to 9729 83 Eight Eight. thanks! This chair is available in Singapore now and I don't need to wait for ordering, correct? I can only msg at night. I'm not in Singapore, but the chairs are. Did you receive the money and pm I sent yesterday? SingPost just delivered the beauty . Thank you for the MO and hats off to you for finalizing the delivery when you are not even in town. Hi unwanted, jus wana noe if basic model can fit lumber support? or only fully loaded model can? Received the chair this afternoon. Assembly was rather straight forward and loving it. Now waiting for the posturefit to come. Btw, I chose the hard floor castors... they are all in hard plastics wheels. Is this correct? I thought hard floor will be those with rubbery wheels. Please confirm. Thank you for the prompt arrangements TS. Like jefftan88, opted for hard floor casters and my wheels are also just hard plastic. Ours looked more like 'standard' wheels. Hope unwanted bro can clarify. Last edited by alantcy; 27-06-2011 at 11:54 PM.. I've checked my chair and it is similar to the standard wheels instead of the hard floor I've ordered. according to the pics alantcy provided i think hard floor casters sud b rubber surface on the wheels. 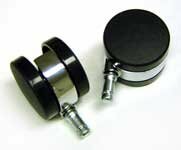 in any case i ordered hard floor casters too but the wheels' surface are plastic. Received my Aeron yesterday. Noticed that the bottom of the gearbox below the seat is not covered up. Can see some mechanism inside. Does newer Aeron comes standard this way? On my older Aeron, it is totally enclosed. One cannot see the internal mechanism at all. Unable to post image due to insufficient post count. Can someone help?